Number One Sun, Wah You So Good? In the beginning, there was meat. Meat, meet fire. Fire + meat = a dawn of a new culinary era. Fast forward from the caveman days to today, and this elemental fixture of meat roasting over a fire drives our entire food industry. 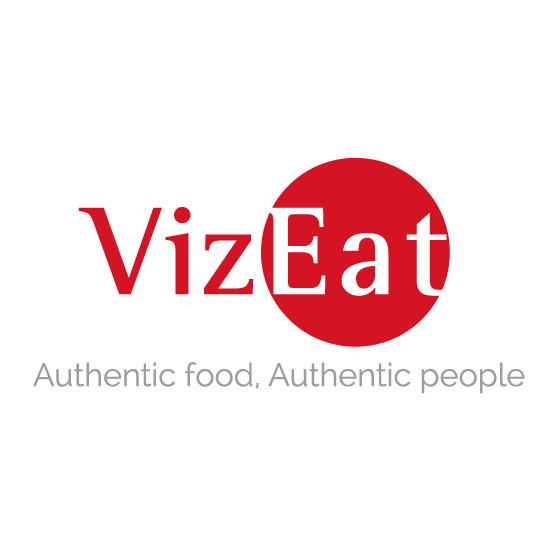 It has been elaborated upon by different cultures and chefs to the delight of generations of eaters around the world. Today’s entry focuses on a restaurant whose entire existence revolves around not only the glorification of roasted meat but the ceremony of serving said meat. 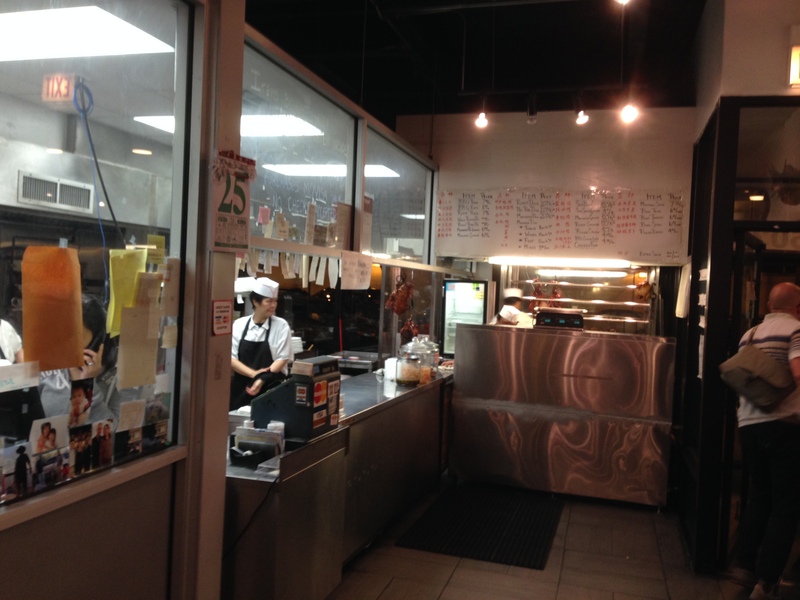 If you’ve new to Hong Kong style barbecue, then I highly recommend visiting Sun Wah BBQ located in the Little Vietnam/Edgewater neighborhood on the North side of Chicago. While there are plenty of top quality Vietnamese restaurants surrounding Sun Wah, this is the number one place to go for Hong Kong barbecue in the area. 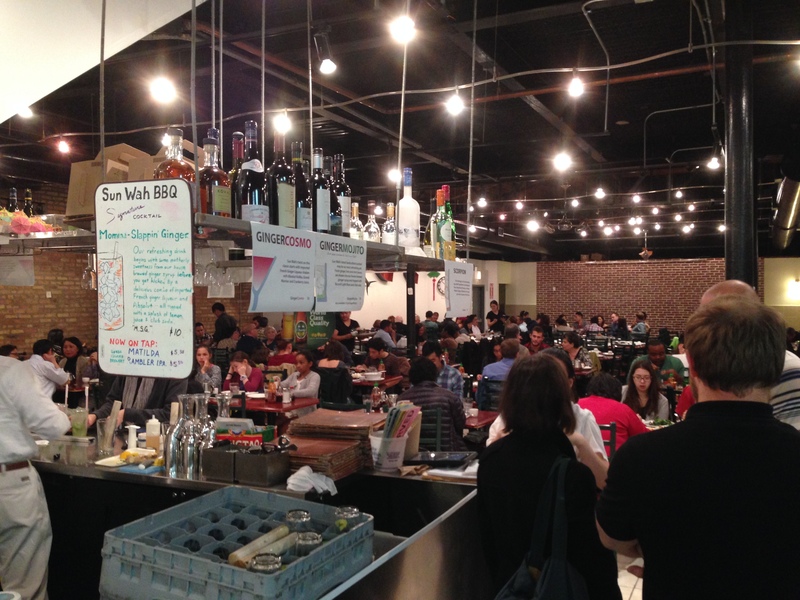 I haven’t tried any places similar to Sun Wah in Chinatown, but I’m sure they’re out there. However, I have tried actual Hong Kong barbecue while in Hong Kong along with some other more serpentine delights. While Sun Wah doesn’t get as crazy as they do back in the homeland, they do offer plenty of quality plates to choose from. 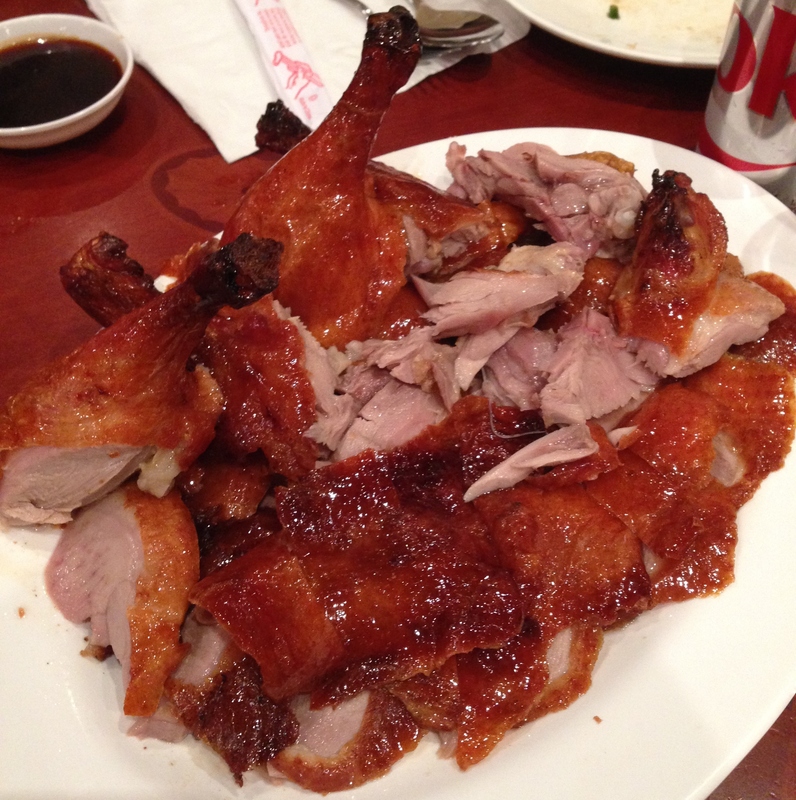 Their crown jewel is their Peking duck service where you can get a full meal for $40. Note: Remember to call ahead to order it when making a reservation since they can run out of ducks! After I tried Peking duck in its home city, Beijing, I can say that Sun Wah’s quality is the same as in China with a couple small differences that I’ll address later. Now, I’ve been throwing around the word “barbecue” left and right in this article, but let’s not get American and Hong Kong barbecue conflated. While American barbecue focuses on using savory/spicy sauces and different types of wood to smoke the meat, HK barbecue utilizes sweet and aromatic glazes to be rubbed on the meat before being placed on a fork and roasted over a fire. Any way you slice it, I love them both! Anyway, back to the meal. Janice, I, and her whole family went there for her mom’s birthday. It was very large and busy inside, and we could inspect the hanging ducks in the front window while we waited for our table to be ready. Once seated, we went ahead and ordered some starters like pan fried soft shell crab, butterfly shrimp, and stir fried Shanghai bok choi. 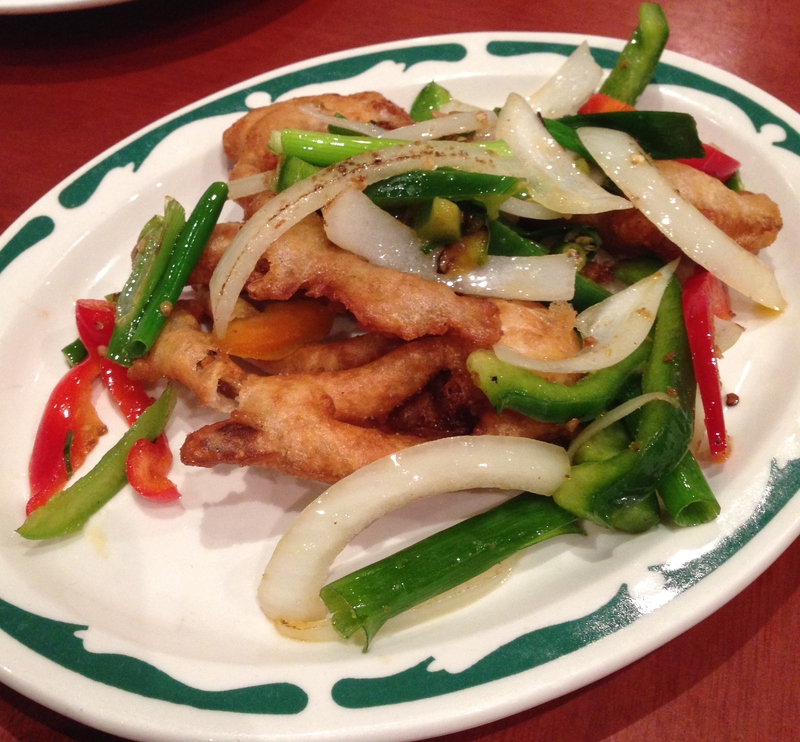 While I’m not a huge seafood fan, I enjoyed the soft shell crab. It was crunchy yet soft on the inside, and the breading was light and buttery. Just goes to show that deep-frying things improves food every time. The butterfly shrimp were really decadent yet so so good. Not only were they fried but wrapped with bacon. *Cue the heavens opening*. 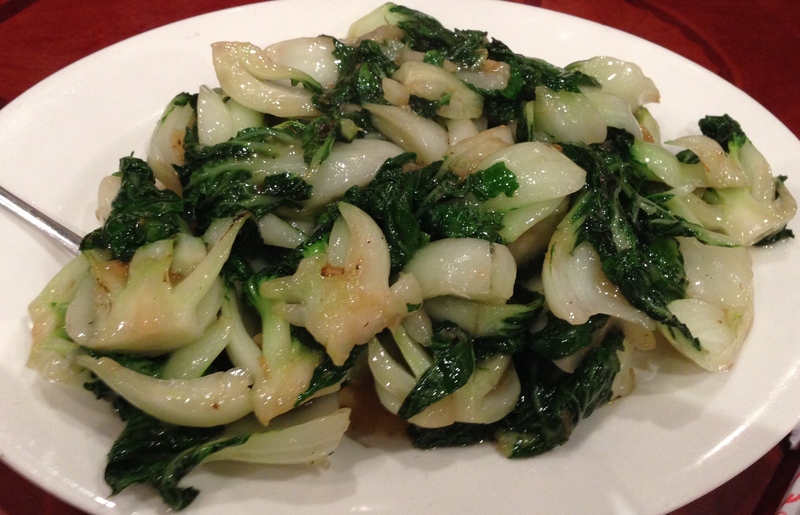 As for the bok choi, it was good but not great. True, it wasn’t fried, but you can only do so much with greens. 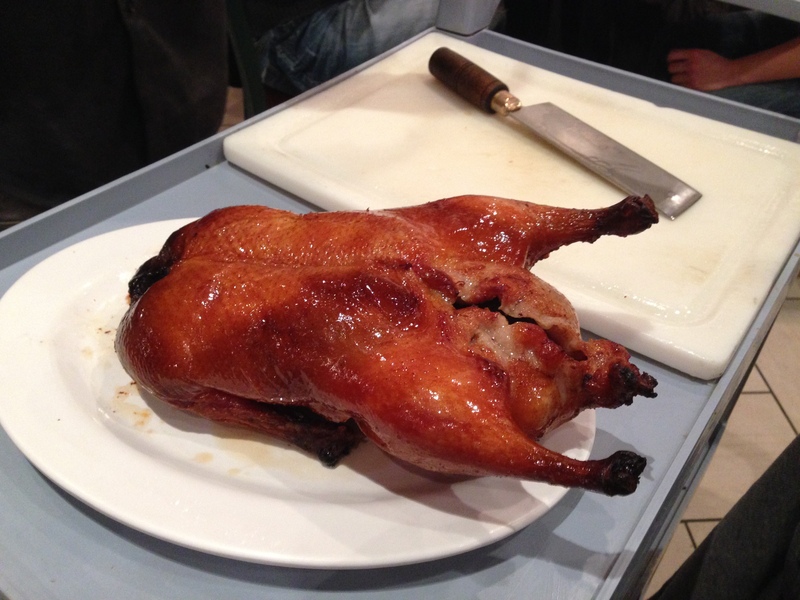 Eventually, the pièce de résistance came out: the Peking duck. The preparation hasn’t changed much since 500 A.D., but as the old adage says, “If it ain’t broke, don’t fix it”. With this meal, I wouldn’t change a thing. 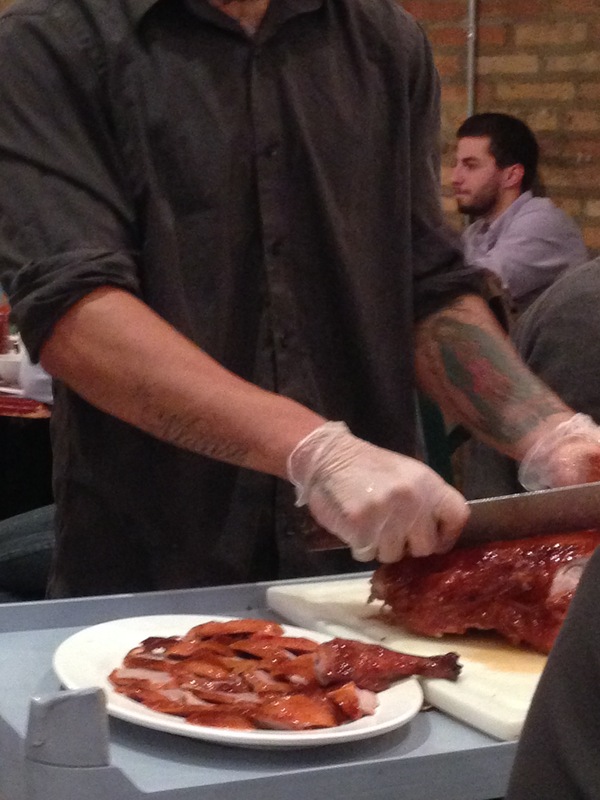 First, they wheeled the roast duck to the side of our table to slice it in front of our eyes. This was very different from my experience in Beijing. Instead of being in a deserted open air courtyard in a small hutong, it was brightly lit and surrounded by friendly faces. The duck in Beijing had the neck and head still attached while the Sun Wah duck had it chopped it off before it even came to our table. Another key difference was the serving style. While in Beijing, they brought each plate out with each component of the duck: skin (the most coveted part of the meal) first, then a bit of meat, and then a connected meat and skin combo with a bisected roasted duck head that I ate. 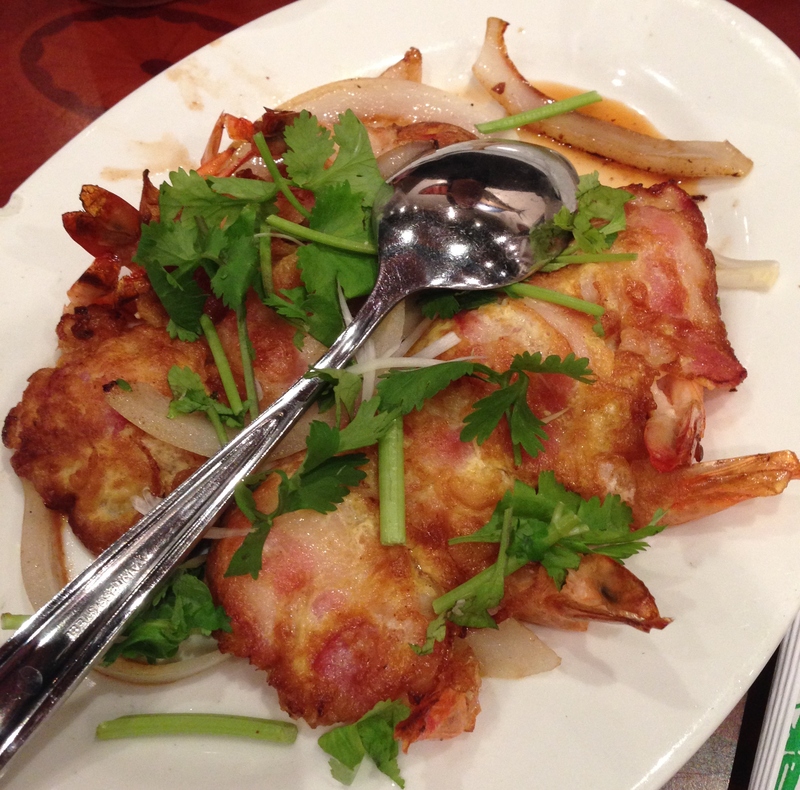 At Sun Wah, time is money, so they just heaped it all on one plate even with drumsticks. They then gave us warm and squishy bread buns, julienned carrots and onions, hoisin sauce, and fried rice on the side. Beijing differed in the fact that they didn’t have carrots, but instead had onions, cucumber, and a thick sweet bean/hoisin sauce. 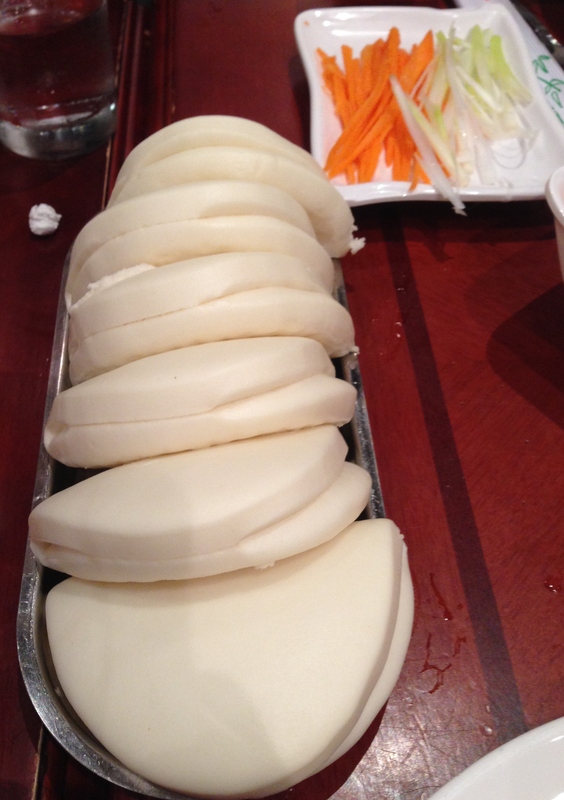 Also, instead of sliced buns, the Beijing Peking duck was eaten with steamed pancakes that were like rice tortillas. 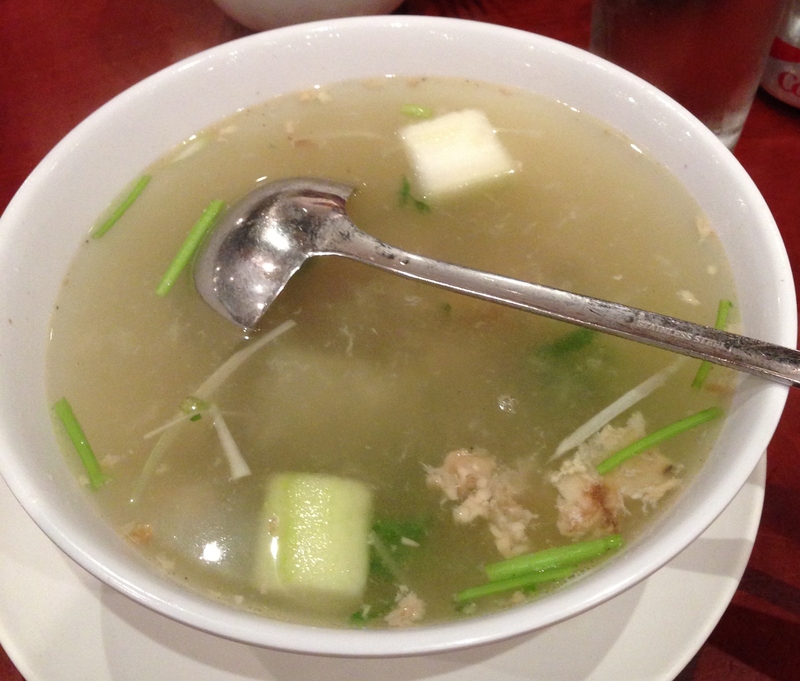 Plus, they also gave me horseradish and sugar on the side that they didn’t at Sun Wah. 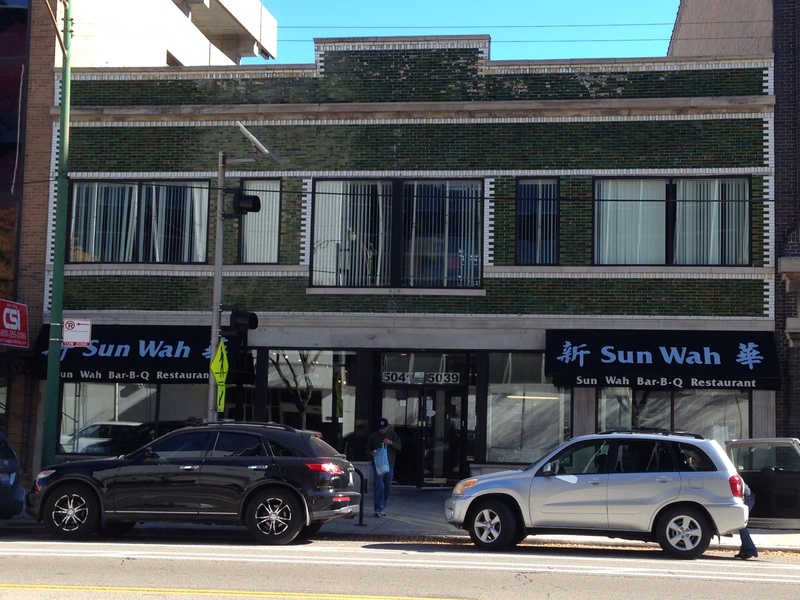 Even though Sun Wah was slightly different, it didn’t mean that it was inferior in any aspect. When all of the aforementioned ingredients were combined in one of the fresh and fluffy buns, it was amazing! From the crunchy sweet skin to the tender duck and fresh vegetables jazzed up with the sweet soy notes, it was a parade of flavors and textures that resulted in culinary perfection. 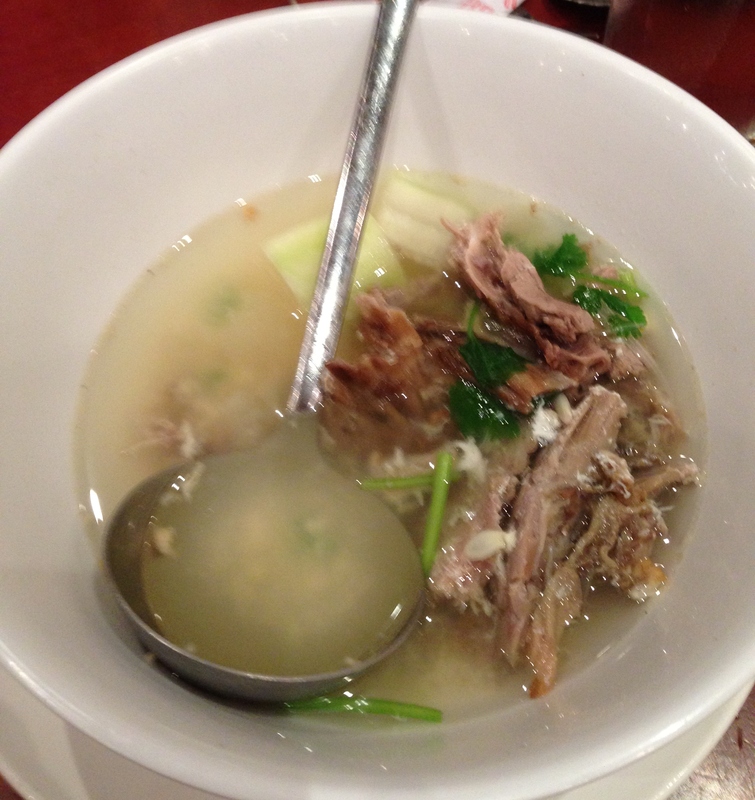 Finally, they took the remaining bones and residual meat into the back to make a thin but rich duck broth filled with crunchy winter melon. It was a warming end to a sumptuous dinner, and a wonderful way to celebrate with Janice’s family. Plus, for a dinner for five, it was less than 100 bucks! Not a bad bill for the duck (pun totally intended). 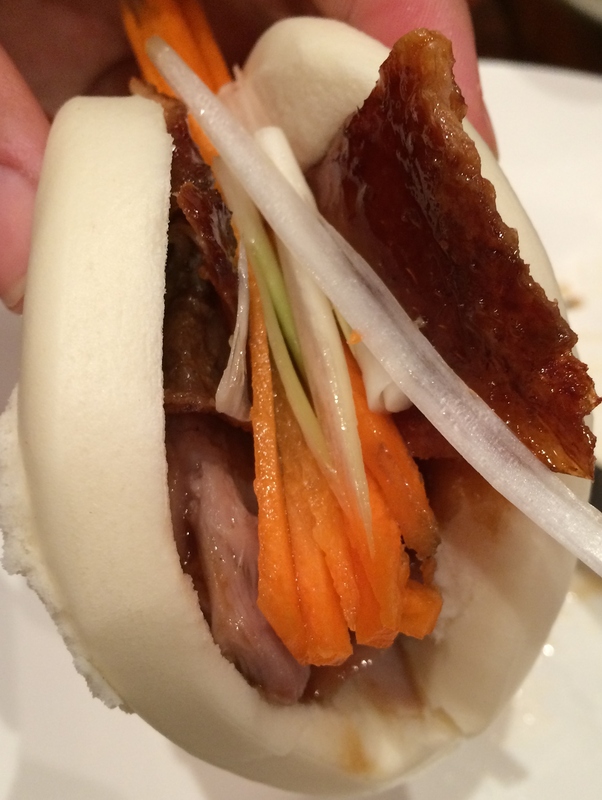 So if you want to get some of the best Peking duck in Chicago or perhaps the country, visit Sun Wah BBQ! Posted in Chinese, Far East Asian Cuisine and tagged barbecue, Chicago, Chinese, crab, dining, duck, Food, hoisin, Hong Kong, roasted, sauce, shrimp, vegetables. Bookmark the permalink.